Greenlife golf course in Malaga. Golf in Costa del Sol, Spain. Greenlife Golf Club is an exclusive golf destination, 9 holes par 3 of 1,142 metres length, situated in Elviria Hills in Marbella. This golf course, which opened in 2000 has a varied course and studied design and thus can enjoy both beginners and more experienced players wishing to improve their short game. Greenlife Golf is located in a beautiful location, with lush vegetation, composed of palms and oaks.The fairways which run around a spectacular artificial lake are composed of holes that reach from 88 up to 169 m. It is a perfect course to enjoy for beginners and professional players. Facilities include driving range and golf academy, tennis courts and a clubhouse with restaurant and a fully equipped gym and sauna, as well as magnificent apartments. Address: Urb. Elviria Hills Avda. Las Cumbres s/n 29604, Marbella, Malaga. 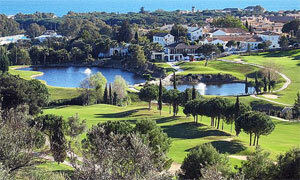 How to get there: From Malaga airport take the motorway A-7 towards Marbella, Elviria exit.